Lemmings - The Chip's Challenge Wiki - The Chip's Challenge Database that anyone can edit! Lemmings is the 35th level in Chip's Challenge 1. 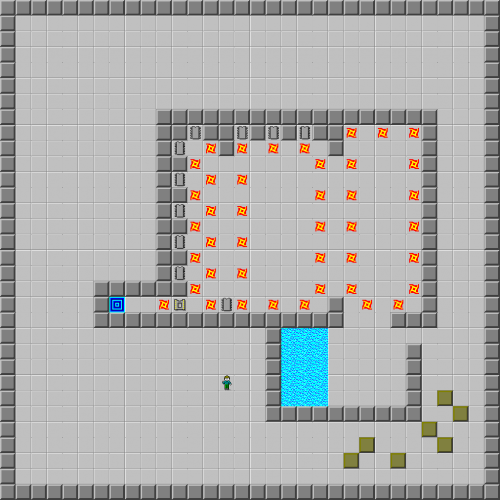 It is named such because the fireballs are blocking the chips, and you want them to drown in the water. Many blocks are provided, but only one is needed. The basic method is to get the fireballs to clash such that they all clear out of the chip section. Use block 3 specifically; run it 6U 5L U  U  6U 2L  2U  U then push the block left getting the 3 chips at the top. Continue pushing the block left until it reaches the wall, collect the 2 chips above the block, then push the block down, collecting the chips along the way. Wait  after the chip at (11,17) then collect the final chip, open the socket, get out of the way of the fireball, wait  and exit.